Elk Grove Village, IL. (January 05, 2018) — Solvent Systems International (SSI) announced today that it has earned the U.S. Department of Agriculture (USDA) Certified Biobased Product label. Two products, Hero Biobased UltraSolve and SSI Vegetable Methyl Ester, are now able to display a unique USDA label that highlights their percentage of biobased content. The USDA Certified Biobased Product label displays a product's biobased content, which is the portion of a product that comes from a renewable source, such as plant, animal, marine, or forestry feedstocks. Utilizing renewable, biobased materials displaces the need for non-renewable petroleum-based chemicals. Biobased products, through petroleum displacement, have played an increasingly important role in reducing greenhouse gas emissions that exacerbate global climate change. Steve Rundell, President of SSI says: "Having our products BioPreferred Biobased Certified shows our commitment to quality. To display a verified biobased percentage gives our customers the knowledge they require to be comfortable in using biobased chemical replacements. And the further innovations to biobased that SSI has made including zero VOC emission Methyl Ester adds to the quality of our products." "We applaud Solvent Systems International for earning the USDA Certified Biobased Product label," said Kate Lewis, USDA BioPreferred Program. "Products from Solvent Systems International are contributing to an ever expanding marketplace that adds value to renewable agriculture commodities, creates jobs in rural communities, and decreases our reliance on petroleum." The increased production of renewable chemicals and biobased products contributes to the development and expansion of the U.S. bioeconomy - where society looks to agriculture for sustainable sources of fuel, energy, chemicals, and products. 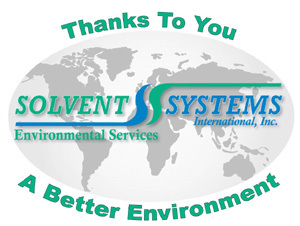 Since 1983 Solvent Systems International has been helping industry to clean cleaner, to use resources more efficiently, and to implement the latest innovations in pollution prevention technology that SAVE money. SSI helps their customers improve their bottom line while improving the environment. Biobased products span a diverse range of applications, such as lubricants, cleaning products, chemicals and bioplastics. The USDA Certified Biobased Product label communicates a product's biobased content. Expressed as a percentage, biobased content is the ratio of non-fossil organic carbon (new organic carbon) to total organic carbon in a product. New organic carbon is derived from recently-created materials. The total organic carbon in a product consists of new organic carbon and old organic carbon that originates from fossil carbon materials, such as petroleum, coal, or natural gas. More than 3,000 products have earned the USDA Certified Biobased Product label. To learn more about the USDA Certified Biobased Product label please visit www.biopreferred.gov, and follow on Twitter at http://twitter.com/BioPreferred. Questions? Send us a note and we will contact you to discuss more. Competitive prices and dependable delivery make SSI a valuable source for your chemical needs.